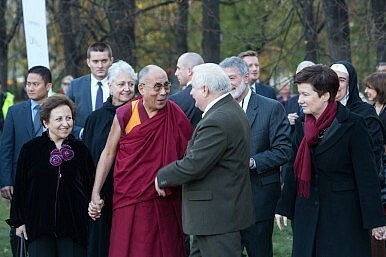 The Dalai Lama at the 2013 World Summit for Nobel Peace Laureates in Warsaw. The 2014 World Summit of Nobel Peace Laureates will no longer be held in Cape Town. “After extensive discussion, it has been decided that the 2014 World Summit of Nobel Peace Laureates in Cape Town, [South Africa] will be suspended,” Cape Town Mayor Patricia de Lille tweeted on the afternoon of October 2. The World Summit, scheduled to be held in Cape Town from October 13 to 15, became the center of a controversy when the Dalai Lama was unable to procure a visa from the South African government. The first indication that the summit would be relocated came from Jody Williams, a Nobel Peace laureate who (along with three others) had decided to boycott the Cape Town summit unless the Dalai Lama was allowed to attend. Williams and fellow laureate Shirin Ebadi joined the Dalai Lama in Dharamsala to celebrate the 25th anniversary of the Tibetan religious leader’s winning the Nobel Peace Prize. There, Williams announced that “the venue of the summit has been shifted out of South Africa… We feel proud that the summit has been cancelled after we lodged protest over denial of visa to the Dalai Lama.” The Dalai Lama himself also noted that the summit had been cancelled. He accused the South African government of “bullying a simple person” in refusing to grant him a visa. In a series of tweets, and in an official statement issued online, de Lille said that “the primary reason for the relocation is the fact that the South African Government refuses to issue a visa for His Holiness, the Dalai Lama.” She then blasted the government for its “profound arrogance and unbelievable inefficiency.” “The National Government … showed that they are more intent on pleasing Beijing than with ensuring that a prestigious international event is held in South Africa,” de Lille wrote, adding that “President Zuma’s government has shamed the legacy of Madiba,” a reference to Nelson Mandela, the South African anti-apartheid activist, Nobel Peace Prize laureate, and national hero. The World Summit this year was to be dedicated to Mandela’s memory. The furor over the Dalai Lama’s visa reflect a deeper insecurity on the part of South Africa — the influence of China on the African country. Ties between China and South Africa have grown rapidly since diplomatic relations were officially established in 1998, especially in the economic realm. China became South Africa’s largest trading partner in 2009, and in 2013 bilateral trade was worth $65.1 billion, a increase of nearly 9 percent over the previous year. South African President Jacob Zuma has actively sought to increase Chinese investment, particularly in infrastructure. However, these growing ties belie a deeper unease on the part of South Africans about China’s influence on their nation. According to a 2014 survey by the Pew Research Center, South Africans are split in their opinions of China. While 45 percent have a favorable image of the Asian giant, 40 percent do not — by far the largest unfavorable rating among the African countries surveyed. South Africans were also closely divided on the question of whether Chinese economic growth is good for their country; 36 percent said no while 41 percent said yes. When it comes to cultural influence, South Africans were even less sure about China’s role. According to a 2013 Pew survey, 60 percent of South Africans disliked the idea of Chinese music, movies, and television spreading in their country. Likewise, a plurality of 46 percent thought that the spreading of “Chinese ideas and customs” in South Africa was bad. There are special concerns about Chinese investment in (and influence over) South African media outlets. Zuma’s African National Congress has even been accused of receiving funding from the Chinese Communist Party, which de Lille referenced in her statement. On the other hand, official initiatives seek to foster even closer cultural ties. In 2014 South Africa unveiled a new initiative to add Mandarin Chinese to the school curriculum as part of an education agreement between the Chinese and South African governments. In a country where public opinion is already divided on China, and where Beijing’s influence is a hotly debated topic, the decision to deny the Dalai Lama a visa was a lightning rod for debate. Accusations of Zuma “kowtowing” to and “appeasing” Beijing reflect far deeper concerns about the South African government’s ability or inclination to stand up to China. Amidst growing ties with China, South Africa reportedly denied the Dalai Lama a visa.